We've all seen the PS3 Grill. Sure, it was cool in its day and all, and we all had a good laugh at the PS3's expense, but that's old news now. It's time for something new. Er, old. Because, umm ... old is ... gold? Ahh whatever! Presenting *drum roll* the PlayStation toaster! Hit the jump for a story about a very talented girl, her equally talented friend and her enterprising father, all of whom were bored and decided to stuff an entire PlayStation 2 in a toaster! Upon checking out Ryou-chan's DeviantART page (thanks, yet again, to Hannah), I stumbled across the PlayStation toaster, a most ingenius device that I would never have imagined in my wildest dreams. Needless to say, I was rather surprised that someone took the time and effort to remove the innards of a PS2, remove the innards of a toaster, and put the PS2 parts in the toaster's shell. Even more amazing is the fact that the PS2 still works! I am a proud nerd and gamer, and I like to use my artistic vision in unexpected ways. I can't take all the credit for the PSToast though. It was really a team effort by my friend and I. Also, my father helped us by driving us around town in search of a toaster and doing some of the things that required the use of machinery (he owns a machine shop). The idea was a product of extreme boredom. My friend and I were sitting around at my house when I suddenly wanted to do a case mod for my ps2. The first thing that poppped into my head was that a kitchen appliance would make an awesome case, and after some brainstorming, it was decided that a toaster would be perfect. Since I had bought the ps2 used, it never really worked perfectly, and the plastic bit on the front of the disk tray was missing. So I thought that it wouldn't really be a great loss if we ended up breaking it in the process. It was surprisingly easy to find a suitable toaster. 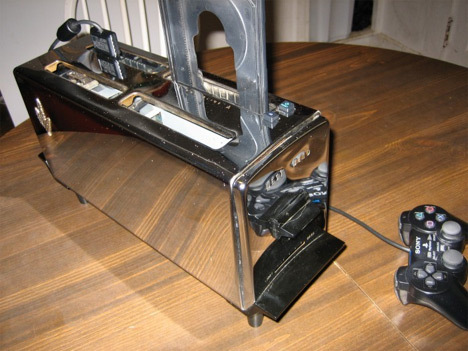 Upon removing the ps2 from its case, we discovered that we would have to use a 4-slice toaster. We ended up finding it at an antique store because evidently modern 4-slice toasters are very rare. By some amazing stroke of luck, it was EXACTLY the right size. It was like the manufacturers of the toaster made it specifically for the purpose of a ps2 mod! plugged in. Oh, and if I remember correctly, we had to saw off some little parts of the ps2's case that couldn't be unscrewed. The whole project was done in an afternoon, and it was easier than I thought it would be. The playstation works as well as it ever did. As far as I know, the only possible risk is the toaster becoming magnetized and screwing up the electronics, but so far I haven't encountered that. I would have to say that the best part is the reactions I get from people when they notice the toaster in front of the TV! I hope it is an inspiration to gamers that there are other ways to mod your console than adding glowing lights and transparent panels. Also, I hope it goes to show that girls do nerdy things like mod their gaming systems too! There you have it, folks. The PlayStation Toaster. I believe this deserves a standing ovation. Nice work, girls! You can't buy it, but someone should make a poster.